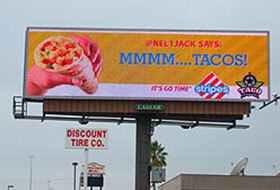 Baton Rouge, LA – February 27, 2014 - Lamar Advertising Company (Nasdaq: LAMR), a leading owner and operator of outdoor advertising and logo sign displays, announces the Company’s operating results for the fourth quarter ended December 31, 2013. Lamar reported net revenues of $320.4 million for the fourth quarter of 2013 versus $306.6 million for the fourth quarter of 2012, a 4.5% increase. See “Immaterial Correction of Prior Period Amounts” below. Operating income for the fourth quarter of 2013 was $63.8 million as compared to $65.1 million for the same period in 2012. Lamar recognized $10.2 million in net income for the fourth quarter of 2013 compared to net income of $7.9 million for the fourth quarter of 2012. Adjusted EBITDA (defined as operating income before non-cash compensation, depreciation and amortization and gain on disposition of assets) for the fourth quarter of 2013 was $145.0 million versus $136.9 million for the fourth quarter of 2012, a 5.9% increase. 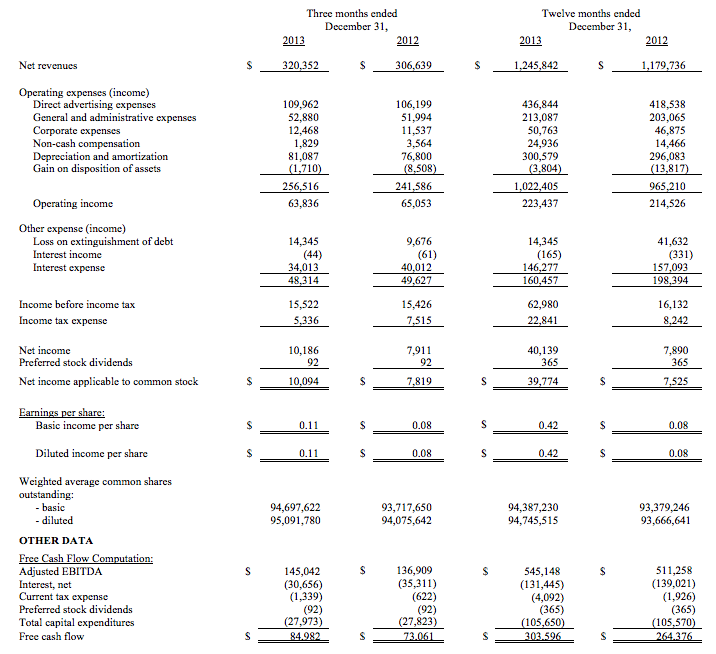 Free Cash Flow (defined as Adjusted EBITDA less interest, net of interest income and amortization of financing costs, current taxes, preferred stock dividends and total capital expenditures) for the fourth quarter of 2013 was $85.0 million as compared to $73.1 million for the same period in 2012, a 16.3% increase. Pro forma net revenue for the fourth quarter of 2013 increased 0.3% and pro forma Adjusted EBITDA decreased 0.9% as compared to the fourth quarter of 2012. Pro forma net revenue and pro forma Adjusted EBITDA include adjustments to the 2012 period for acquisitions and divestitures for the same time frame as actually owned in the 2013 period. Pro forma net revenue, pro forma Adjusted EBITDA and pro forma outdoor operating income have also been adjusted to eliminate the effect of the immaterial correction in both the 2012 and 2013 periods1. See “Immaterial Correction of Prior Period Amounts” below. Lamar reported net revenues of $1.25 billion for the twelve months ended December 31, 2013 versus $1.18 billion for the same period in 2012, a 5.6% increase. Operating income for the twelve months ended December 31, 2013 was $223.4 million as compared to $214.5 million for the same period in 2012. 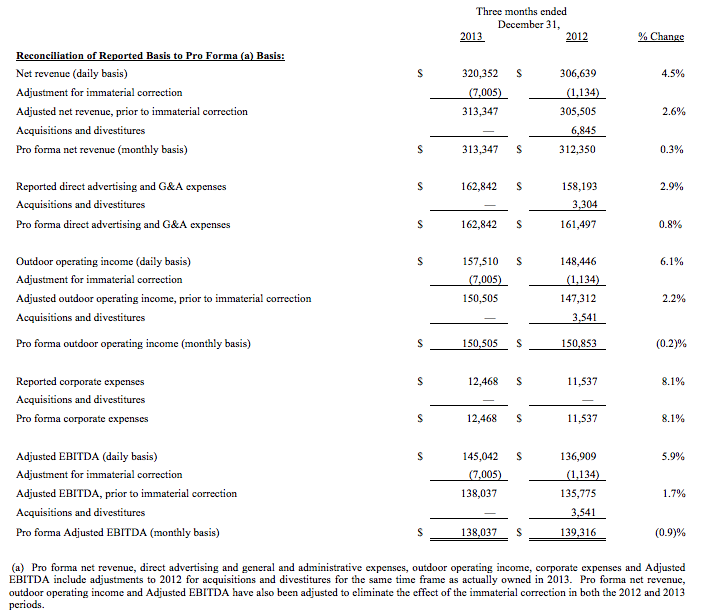 Adjusted EBITDA increased 6.6% for the twelve months ended December 31, 2013 to $545.1 million from $511.3 million for the same period in 2012. There was net income of $40.1 million for the twelve months ended December 31, 2013 as compared to net income of $7.9 million for the same period in 2012. 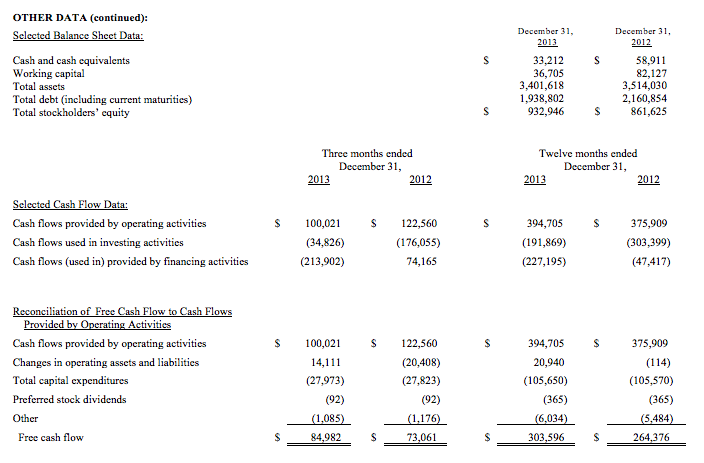 Free Cash Flow for the twelve months ended December 31, 2013 increased 14.8% to $303.6 million as compared to $264.4 million for the same period in 2012. The Company has historically recognized revenue on a monthly basis over the term of each advertising contract which produced results that were consistent with generally accepted accounting principles in all material respects. Commencing with the fourth quarter of 2013, revenue is recognized on a daily basis and will be going forward. An example that illustrates monthly versus daily revenue recognition is included on page 8. The Company evaluated the effect of this correction under Staff Accounting Bulletin Nos. 99 and 108 and concluded that it is immaterial to the current and prior periods. Actual reported revenue for the fourth quarter and all prior periods presented in this earnings release have been adjusted to reflect this immaterial correction. In line with its historical practice, the Company will continue to present pro forma results and quarterly guidance based on monthly revenue recognition. See “Reconciliation of Reported Basis to Pro Forma Basis” on page 7 of this release, which presents pro forma net revenue after acquisition adjustments and prior to the correction. As noted in this schedule, pro forma net revenue on a monthly basis for the fourth quarter of 2013 is $313.3 million, a 0.3% increase over the fourth quarter of 2012. A schedule comparing net revenue recognized on a monthly basis to net revenue recognized on a daily basis for the years ended December 31, 2013, 2012 and 2011 is also included in the release. 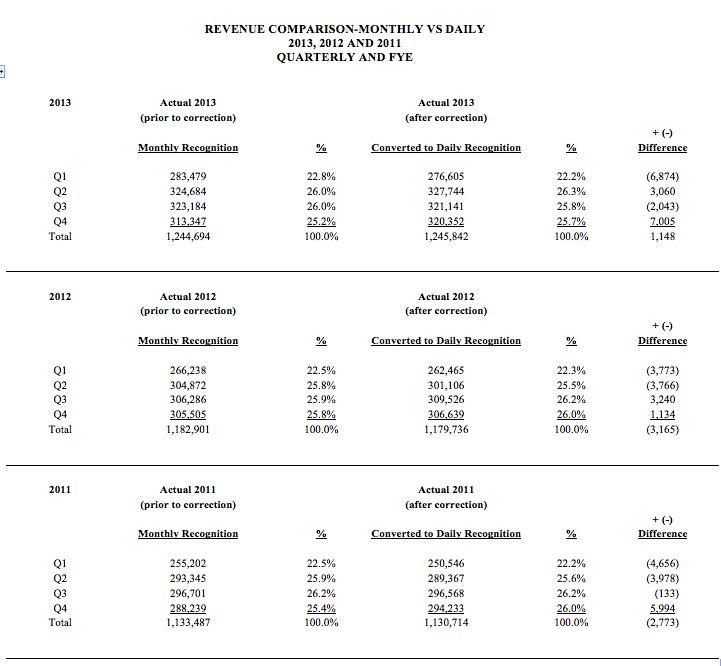 See “Revenue Comparison Monthly vs Daily” on page 8. 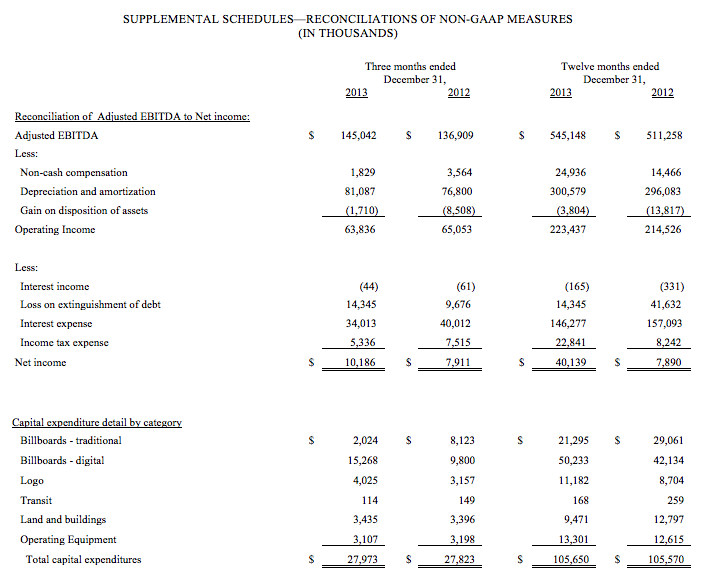 1 Adjusted EBITDA, free cash flow, pro forma results and outdoor operating income are non-GAAP Financial Measures. Please see “Use of Non-GAAP Measures” and ‘Supplemental Schedules—Reconciliations of non-GAAP Financial Measures” below on pages 6-8. For the first quarter of 2014, the Company expects net revenue as recognized on a monthly basis without giving effect to the correction to be approximately $290 million to $293 million. On a pro forma basis this represents an increase of approximately 1% to 2%. The Company will continue to provide net revenue guidance for 2014 based on monthly revenue recognition consistent with past practice. As of December 31, 2013, Lamar had $126.2 million in total liquidity that consists of $93.0 million available for borrowing under its then-existing $250 million revolving senior credit facility and approximately $33.2 million in cash and cash equivalents. Currently, Lamar has approximately $243 million available for borrowing under its revolving senior credit facility. See “Recent Transactions—Senior Credit Facility” below. Senior Credit Facility. On February 3, 2014, the senior credit facility of Lamar’s wholly owned subsidiary, Lamar Media Corp., was amended to increase the revolving credit facility from $250 million to $400 million and extend its maturity date to February 2, 2019. The incremental facility was also increased from $300 million to $500 million. In addition, the senior credit facility was amended to include provisions that would allow Lamar Media to conduct its affairs in a manner that would allow Lamar Advertising to qualify and remain qualified as a real estate investment trust (REIT). Notes Offering. On January 10, 2014, Lamar Media Corp., closed a private placement of $510 million in aggregate principal amount of 5 3/8% Senior Notes due 2024, which resulted in net proceeds to Lamar Media of approximately $502 million. Lamar Media used the proceeds of the offering to pay off all loan balances outstanding under its senior credit facility. Early Extinguishment of Debt. On December 4, 2013, Lamar Media redeemed in full all its outstanding 9 3/4% Senior Notes due 2014 at a redemption price equal to 100% of the aggregate principal amount of outstanding Notes plus a make whole amount and accrued and unpaid interest up to but not including the applicable redemption date for an aggregate redemption price of approximately $366.4 million. The redemption was funded using cash on hand of $182.4 million and borrowings under Lamar Media’s revolving credit facility of $184 million. In connection with the redemption, the Company recorded a loss on early extinguishment of debt of $14.3 million for the fourth quarter of 2013, of which $3.9 million related to the write off of previously capitalized and unamortized debt issuance fees. As previously announced, Lamar is actively considering an election to convert to a REIT status. In conjunction with this review, Lamar submitted a private letter ruling request to the U.S. Internal Revenue Service (the “IRS”) in November of 2012 addressing certain matters relevant to its contemplated qualification as a REIT. After a delay caused by internal IRS procedures and considerations, in November 2013 Lamar was advised by the IRS that it will resume issuing private letter rulings regarding the REIT provisions of the Internal Revenue Code of 1986, as amended, and that the IRS is actively working on Lamar’s private letter ruling request. Based on current information, Lamar believes that it will be in a position to convert to a REIT effective January 1, 2014. Lamar’s decision to proceed with a REIT election is subject to the approval of its board of directors. A favorable IRS ruling, if received, does not guarantee that Lamar would succeed in qualifying as a REIT and there is no certainty as to the timing of a REIT election. Lamar may not ultimately pursue a conversion to a REIT, and it can provide no assurance that a REIT conversion, if completed, will be successfully implemented or achieve the intended benefits. This press release contains forward-looking statements, including the statements regarding guidance for the first quarter of 2014; consideration of an election to real estate investment trust status; and the ability to complete the REIT conversion effective for the taxable year beginning January 1, 2014 and remain qualified as a REIT assuming a conversion is successfully completed. These statements are subject to risks and uncertainties that could cause actual results to differ materially from those projected in these forward-looking statements. These risks and uncertainties include, among others: (1) our significant indebtedness; (2) the state of the economy and financial markets generally and the effect of the broader economy on the demand for advertising; (3) the continued popularity of outdoor advertising as an advertising medium; (4) our need for and ability to obtain additional funding for operations, debt refinancing or acquisitions; (5) our ability to qualify as a REIT and maintain our status as a REIT assuming we successfully qualify; (6) the regulation of the outdoor advertising industry by federal, state and local governments; (7) the integration of companies that we acquire and our ability to recognize cost savings or operating efficiencies as a result of these acquisitions; (8) changes in accounting principles, policies or guidelines; (9) changes in tax laws applicable to REITs or in the interpretation of those laws; (10) our ability to renew expiring contracts at favorable rates; (11) our ability to successfully implement our digital deployment strategy; and (12) the market for our Class A common stock. For additional information regarding factors that may cause actual results to differ materially from those indicated in our forward-looking statements, we refer you to the risk factors included in Item 1A of our Annual Report on Form 10-K for the year ended December 31, 2013, as supplemented by any risk factors contained in our Quarterly Reports on Form 10-Q. We caution investors not to place undue reliance on the forward-looking statements contained in this document. These statements speak only as of the date of this document, and we undertake no obligation to update or revise the statements, except as may be required by law. Adjusted EBITDA, Free Cash Flow, pro forma results and outdoor operating income are not measures of performance under accounting principles generally accepted in the United States of America (“GAAP”) and should not be considered alternatives to operating income, net income, cash flows from operating activities, or other GAAP figures as indicators of the Company’s financial performance or liquidity. The Company’s management believes that Adjusted EBITDA, free cash flow, pro forma results and outdoor operating income are useful in evaluating the Company’s performance and provide investors and financial analysts a better understanding of the Company’s core operating results. The pro forma acquisition adjustments are intended to provide information that may be useful for investors when assessing period to period results. Management also deems the presentation of the effect of the correction in its method of revenue recognition useful to allow investors to see the impact of the correction and to provide pro forma results that are comparable with prior periods and in line with the Company’s presentation of market guidance. Our presentations of these measures may not be comparable to similarly titled measures used by other companies. See “Supplemental Schedules—Reconciliations of Non-GAAP Measures,” which provides reconciliations of each of these measures to the most directly comparable GAAP measure. 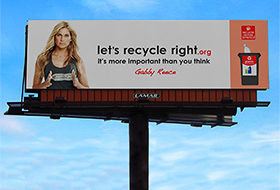 Lamar Advertising Company and Recycle Across America team up for a new celebrity PSA campaign focused on the importance of recycling right.